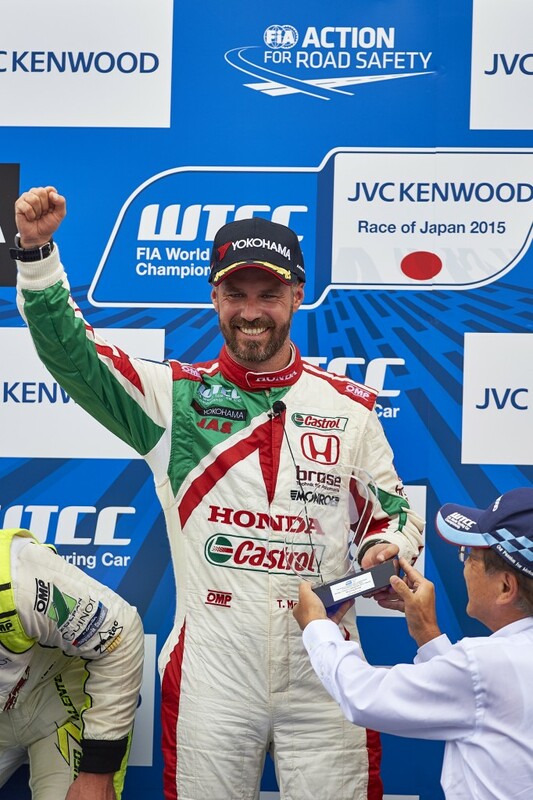 Tiago Monteiro has achieved the dream this weekend; taking a superb victory for Honda on home ground. Both of today’s FIA World Touring Car Championship races yielded exhilarating, and often tense, action from start to finish and for Honda, gave plenty of reason to celebrate. 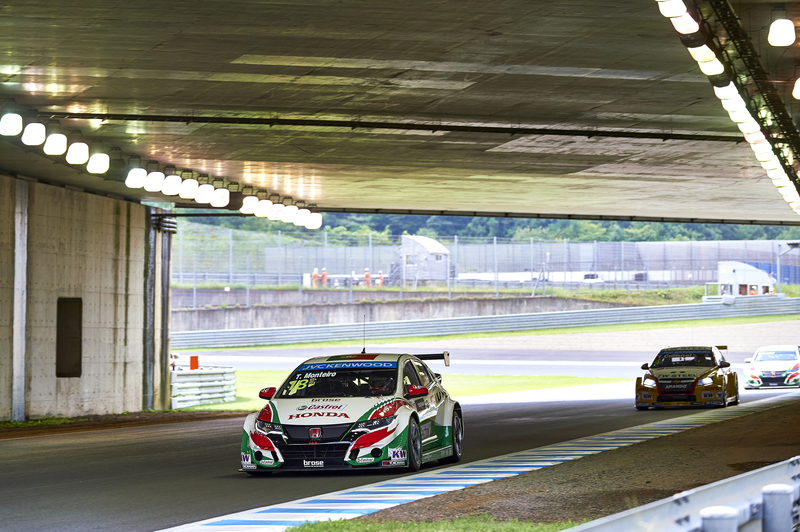 Amassing the win, combined with three podium finishes, a mighty fightback from 17th to 9th for Monteiro and an epic last chance battle between Tarquini and Sebastien Loeb, added to Michelisz’s pole position yesterday and the quickest time in both races, the team leave Motegi with a great sense of achievement and pride. To the first race and things were off to a flying start with non-stop action from lights to flag. 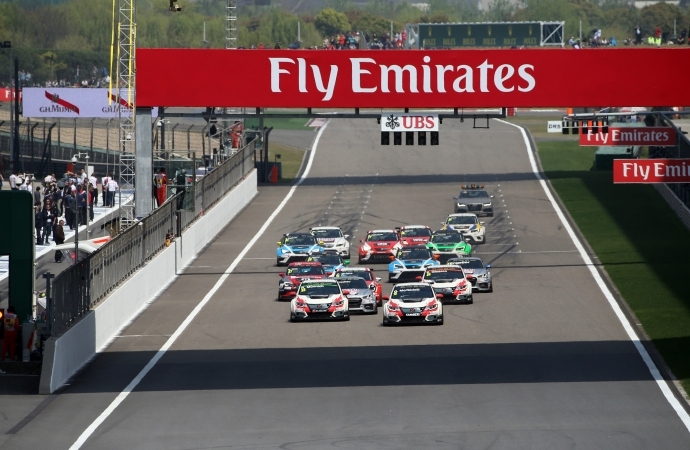 Immediately challenged off the line by Jose Maria Lopez, pole-sitter Norbert Michelisz’s determination to retain the lead was evident for all to see as the Hungarian ace perfectly executed his ‘feisty but fair’ defence. Lopez would just creep ahead and take advantage, but wasn’t without the persistent presence of Civic WTCCs in the mirrors  behind a Honda vs Honda battle played out with Gabriele Tarquini joining the fray thanks to a perfect lunge off the line, gaining three places from his 6th place grid slot. Proving once again the depth of Honda’s motorsport pride, Tiago Monteiro – starting his 200th FIA WTCC race – was the man on the move. Despite his demotion to the back of the grid, the ever committed ex-F1 racer once again effected a perfect start, not only rapidly progressing through the field but providing arguably some of the best on-track action much to the delight of the local support  including tense wheel-to-wheel action culminating in a three-abreast challenge with Rob Huff and Hugo Valente – undoubtedly highlighting the pace in the car and desire in Monteiro to push to the flag. Upfront the internal Honda battle continued with Tarquini setting the fastest lap as the Civic WTCC duo continued to chase. Michelisz crossed the line in 2ndfrom Tarquini, with Monteiro finishing a respectable 9th after his resurgent drive through the field. In the second race Monteiro made his now custom start launch, immediately emerging as the race leader having eclipsed Hugo Valente off the line with supreme confidence  the position he would maintain with an extended gap over the second-placed finisher. For Tarquini it was a frenetic race from start to finish – the race one podium finisher locked in an enthralling battle with Ma Quing Hua, Rob Huff and latterly Sebastien Loeb. A relentless drive from Tarquini ensured the Civic WTCC was well within the mix and chasing for further podium success but as it looked like 4th would be a points-scoring finish, the final lap and final yards would bring in an exciting last chance fight with Loeb, the Frenchman just edging fractionally ahead as the two crossed the line.